Baked Chicken Wings - Seriously the BEST Crispy Baked Chicken Wings! I have tried all the different methods for Baked Chicken Wings against mine, and I still think these are the best! There are hundreds of rave reviews in the comments too. These Baked Chicken Wings are extra crispy thanks to a special cooking method of parboiling to get rid of excess fat, then cooking in a super hot oven. Less fat, less calories, and healthier than deep-fried wings! This recipe for crispy baked wings is one of the oldest and most popular on my site, and for good reason. Chicken wings are SO good! I have long been enamored with wings (as evidenced by the many variations on my site, like these Garlic Parmesan Wings and Korean Chicken Wings), and I’ll use any sports event that comes up on TV as an excuse to make them. In the 6 years since this recipe has been posted, new methods for baked wings have surfaced. I thought it was time to revisit this recipe and see if those methods were better than this one. First, there are some recipes where you simply bake the wings instead of parboiling them first, and I already knew when I originally posted this recipe that parboiling is better, because I tested them side by side. Parboiling adds an extra step, but is worthwhile. I’ll talk more about that further down. 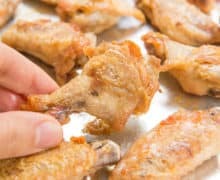 A newer popular method is to coat the wings in baking powder and bake them in a low oven (250F) for a while, then in a high temp oven (425-450F). I personally found that method to be a little bit more crackly than crispy, and the skin felt leathery to me. I wasn’t a fan. Then I tested a hybrid of the baking powder method with my own (you can see the side-by-side of all of them above), but it wasn’t as crispy as the parboil method, and it felt more fussy than the original. At the end of the day, the original parboil and bake method from 2012 remained my favorite. To get started, we are going to parboil our wings before they hit the oven, which is the secret to crispy baked chicken wings. 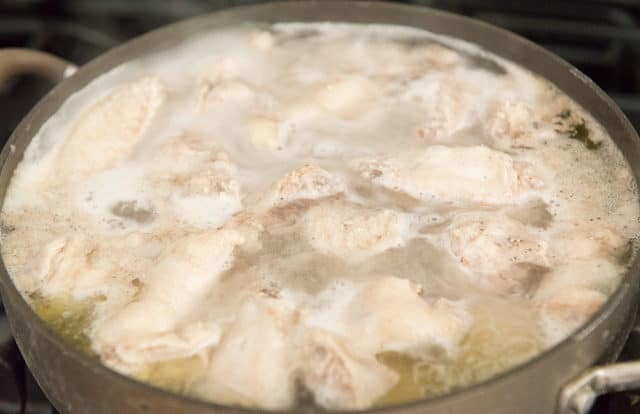 If you’re not familiar with parboiling, all that means is were going to partially cook the chicken wings in simmering water before baking in the oven. Boiling meat feels very strange, but I’ve done test batches comparing parboiling to straight baking, and parboiling is the way to go. It helps get rid of some of the excess fat so the chicken wings are crispier. It’s kind of like when you have to render out the fat on a duck breast in order to get it crispy. Parboiling boils away some of the excess fat so we can get a thin layer that crisps more easily than a thick and flabby layer. Place the wings on paper towels and dry them very well, giving each one a squeeze. It’s REALLY important to dry them well with the towels, because it has a big impact on how crispy the wings will end up later. In order for the wings to get crispy, all the surface water must evaporate and cook off first, so you want as little there as possible from the start. How long to bake chicken wings? Bake the wings in a 450F oven for about 25 minutes, until you start to see golden brown bits on the bottom of the wings. But, we need to cook it more! Most of it is still isn’t crispy yet. Then they’re ready to be tossed with Buffalo Wing Sauce and enjoyed. If you prefer something that isn’t spicy, you may like Garlic Parmesan Wings better. I also have sweet and spicy Korean Chicken Wings. Serve the wings with Blue Cheese Dip, Buffalo Garlic Knots, and Buffalo Chicken Dip (or the Crockpot version, Crockpot Buffalo Chicken Dip) to round out a full spread of football snacks! Update: Some people have reported issues with the wings sticking to the pan. 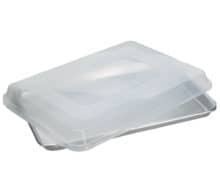 For this recipe I use these uncoated sheet pans. I find that nonstick pans are garbage, and they don’t work for this. I threw all my nonstick coated sheet pans away because they aren’t better than uncoated. 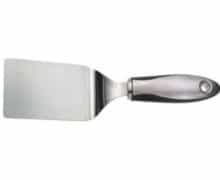 Also, I use this turner to really get under the chicken wing and scoop it off. Because the pan is uncoated, I don’t have to worry about scratching the pan. People have also commented below that greasing the pan works well. Feel free to use any high smoke point oil like avocado, vegetable, canola, etc. Just make sure you don’t put parchment paper or a silicone mat underneath the wings, because they won’t crisp up the same. Bake on an uncoated sheet pan for best results, and use a turner like this to really get under the wings and scoop the crispy bits off. 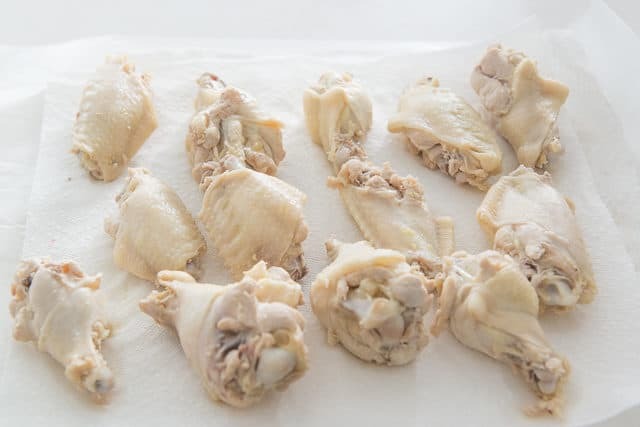 Can you freeze cooked chicken wings? I only recommend you bake these fresh. They won’t stay crispy later. Can you make chicken wings ahead of time? 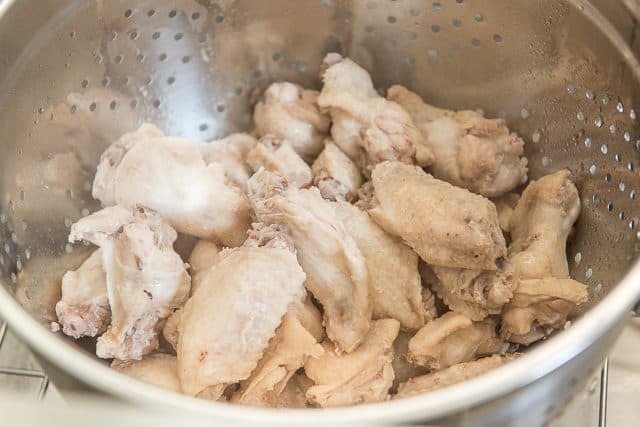 Yes, go through all the steps of parboiling the wings and drying well with a paper towel, then place the wings on a sheet pan and let them sit in the refrigerator UNCOVERED for up to 6 hours. Then all you have to do is pop them into the hot oven and bake them. Because they will be cold, they will likely need to bake a little longer. 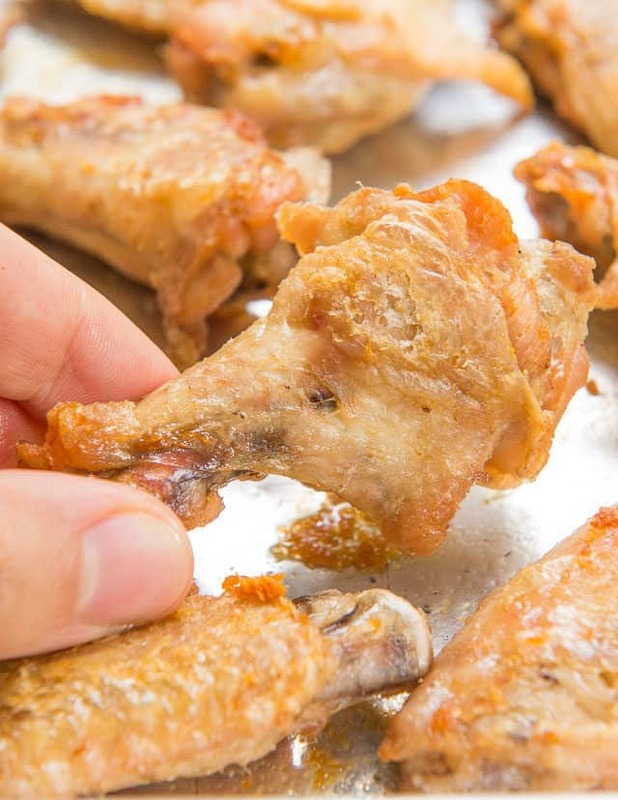 Can frozen chicken wings be baked? Never cook meat from a frozen state, always thaw first. Because you will be parboiling these anyway, you can thaw them quickly in cold water, then parboil them. What goes with baked chicken wings? I like to serve them with homemade Blue Cheese Dip, cut celery sticks, and carrot sticks. 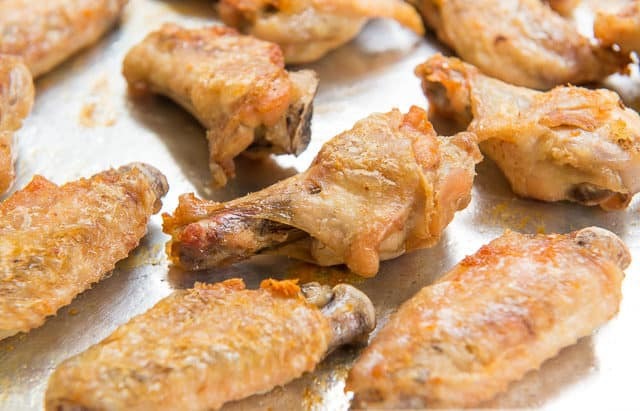 Are baked chicken wings gluten-free? Yes, these chicken wings are made without baking powder, without flour, without breading of any kind. 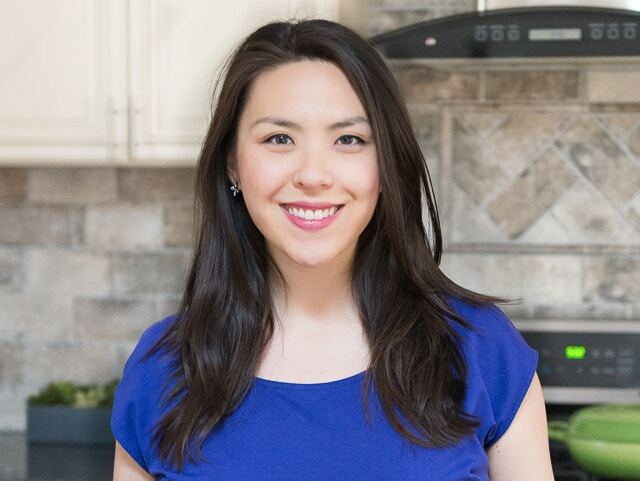 They are also Paleo, Whole30, and friendly to other kinds of eating styles. You can add the sauce of your choice or eat them as is. 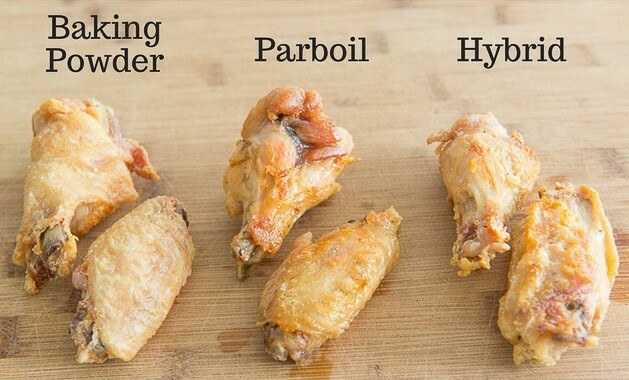 Are baked wings healthier than deep fried? Yes, definitely! Parboiling renders out some of the fat in the wings, and the remaining fat is used to crisp the wing naturally. 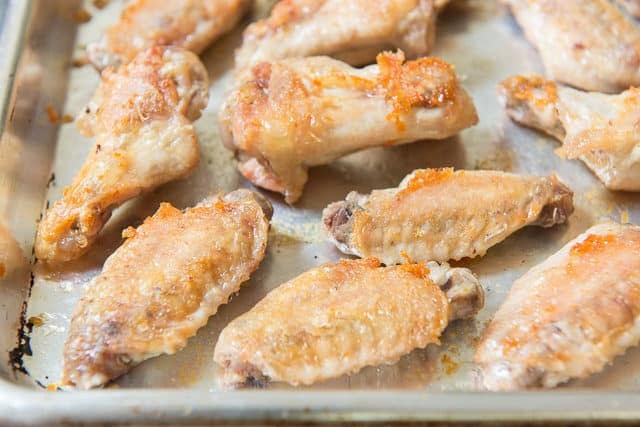 Do not bake the wings on parchment paper or a silicone mat. It won’t crisp up the same. If the wings turn out dry, this means they were overcooked. The sizes of wings at grocery stores vary hugely, so use the baking times as estimates, and check them for the visual cues shown above. They definitely shouldn’t be dry on the inside. The Best Baked Chicken Wings! Less fat and less calories thanks to a cooking method of parboiling then baking in the oven. Heat up a big pot of boiling water. Season the water like you would for cooking pasta (taste the water, it should taste a little repulsively salty, like sea water). Add the chicken wings to the pot, and reduce the heat slightly to keep them at a simmer for 7 minutes. Drain the wings with a colander, then place them on a wire rack to drip dry for a couple minutes. Then dry them very well with a paper towel. 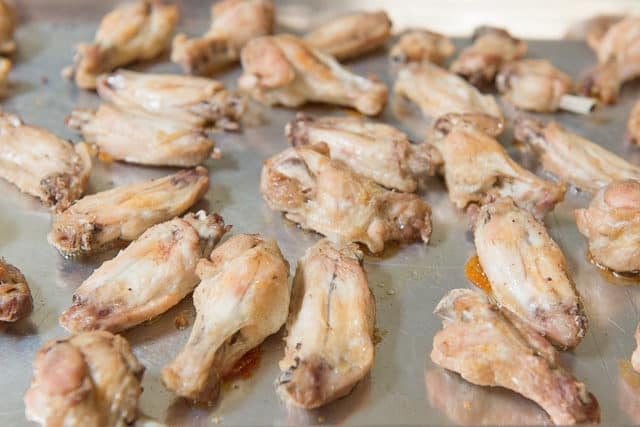 Place the chicken wings directly on a metal sheet pan, with the fattier top side down. 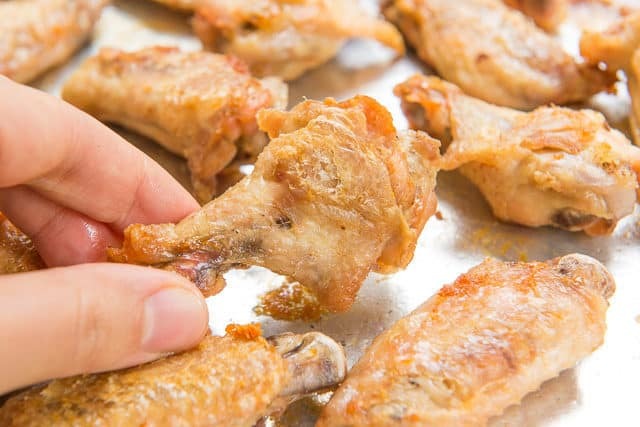 Bake the chicken wings for 25 minutes on the first side, then flip the wings and bake for another 5-10 minutes on the other side, until the skin looks golden and crisp. If serving the wings with sauce, coat them while they're hot out of the oven. I like my Perfect Buffalo Wing Sauce, but you can do Garlic Parmesan Wings for a non-spicy option or this sweet and spicy Korean Chicken Wings sauce. Enjoy! 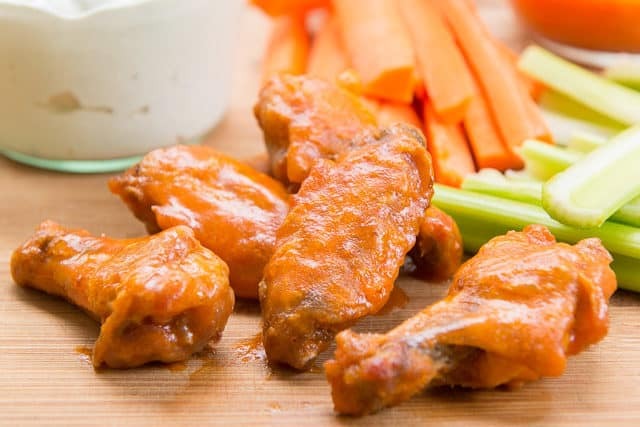 Updated note about cooking time: Chicken wings sold in grocery stores vary in size, so if you have smaller wings, you will probably only need to bake them for a total of 25 minutes. I’ve always done around 40 for mine, but they’ve been large wings. Post updated in November 2018. This post contains affiliate links. My family said these were the best wings I have ever made! Thank you for the new cooking method and delicious wings. Wings are my favorite food and I have made dozens of different recipes. This is my favorite. I made it exactly as described and they were wonderful. Then I tried tweaking it a few different ways (I have made these at least 20 times since finding the recipe) and I found that the following is the way to go. Skip the salt, it didn’t seem to do anything. Put parchment paper on the pan, it keeps them from sticking and they still turn out super crispy. Drying the wings before putting in the oven is also unnecessary, it didn’t make a difference if I skipped it. Can you use non-stick tin foil instead of parchment? I tried this technique tonight and I have never made crispier wings. I actually stopped by Wing Stop and bought the lemon pepper and garlic parmesan sauces and it tasted just like the wings from any chicken wing store for a fraction of the cost and more healthy!! Winner winner chicken dinner! My wing-loving sons-in-law couldn’t believe how great these were! I’ll be making these often. Thanks for testing the different methods to find the best!